Argo is a Judicator Giant and the Master of the Spears of the Church covenant. Tasked by Gwyn, Lord of Cinder to protect Filianore and ensure she does not awake from her slumber, his loyalty to the Gods is absolute and will not tolerate trespassers. 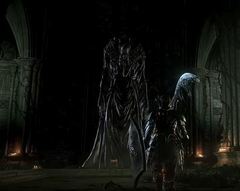 Judicator Argo will speak to the player as they approach the Church Doors and warn them not to enter. Upon entering the church he will admonish them for their intrusion and summon a Painting Guardian to attack them. If the player has defeated Argo and his champion then they can resurrect him for a number of souls at the Purging Monument. This will allow them to rejoin the covenant and continue to level up its ranks, although re-entering the Church will make him hostile again. Foolishness. The King's decree is no trifling matter. I, Judicator Argo, shall deliver thee justice. …Spear of the Church, sword defender of our Princess Filianore! Harken to the call that summons thee! Spear of the church, by the sacred decree, protect our Princess.